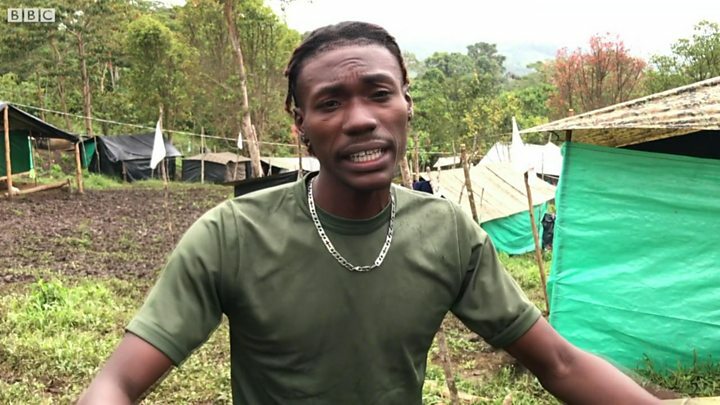 Media captionJhon Steban Perez is a Farc rebel trying to make it as a rapper. "Now without arms with the voice of the word, we want freedom so we can have education, health and dignity for all of the nation." Eyes closed and snapping his fingers to the beat, Jhon Steban Perez is practising the song which, one day, he hopes will lead him to a bigger stage. It is called "Canción de Reconciliación" (Reconciliation Song). Steban, as he prefers to be known, is a member of the Farc. And his only stage today is a muddy hilltop near the small town of Icononzo, about a four hours' drive south-west of the Colombian capital, Bogotá. It is there that 325 former Farc rebels are now living in what is known as a "zona veredal", one of 26 transition camps dotted around the country. They were set up as part of an historic peace deal which ended more than five decades of armed uprising. "It's better now," says Steban. "We no longer expect bombs to fall from the sky. We are breathing a new air, the air of peace." Steban has found a way to express his hopes for the future - rap. With studs in both ears, a big silver chain and dressed in black and blue fatigues with a khaki T-shirt, he looks every inch the guerrilla rapper. He joined the Farc when he was just 14 and fought alongside the rebels. He points to a nasty-looking scar on his wrist:"I got this injury during a clash with the army. But that's now in the past." Now aged 28, Steban explains: "I've swapped my gun for a guitar." His comrades meanwhile gave up their weapons for tools and their bullets for nails. The former Farc fighters started arriving in this camp in January and, over several months, they built a village on the mountainside. It is rudimentary and basic, most of the people here live in shacks. There are no brick walls, just green and black tarpaulin which barely keeps out the rain. Getting from one place to the other involves going up and down a steep slippery slope. "It's not that bad here" says former fighter Tito Cortez, one of many who no longer wears the Farc green battledress, preferring instead a branded tracksuit top and jogging pants. "Compared to where we used to camp out in the jungle, this is like five-star accommodation." But Farc leaders have complained that, despite months of planning, most of the transition camps are still lacking the basic amenities they say they were promised. A larger building, high up the hill, serves as a makeshift classroom. Fernando is 45. He used to be a front-line commander. Now he is studying again, hoping to return to university to finish his social sciences degree. "The government has done very little to help us settle here" he says. "There is no proper sanitation, no infrastructure. Everything you see around you, we did it alone." A special team of observers is in charge of overseeing the handing over of weapons. They are part of what is called the MMV, the monitoring and verification mechanism. It is made up of three equal parts - the Farc, the government and the United Nations. Journalists wishing to speak to one member cannot do so without representatives of the two other groups being present. This tripartite approach underlines the delicate nature of the situation. The peace process is still fragile and it's important to show the world that former enemies can work together. Ask three different MMV observers, representing the different sides, the same question: "Is the process on track?" and you will get the same answer, nearly word for word. "We're all united and taking it one small step at a time." Everyone is on message. The camp is a stepping stone towards rehabilitation. If everything goes to plan, the Farc will transform itself into a political force and its former fighters will re-enter society. But, for many who have little or no formal education, that will be a huge challenge. Mireya Suarez became a member of the Farc when she was 19. She now takes classes in the camp, hoping to better herself and prepare for the day when she will finally leave. She has a 12-year-old daughter, born during the conflict but who will grow up away from weapons and war. "I'm confident our future will be better. But I don't know how to live in the city. My fellow Colombians will have to teach me." Also looking ahead is self-styled guerrilla rapper Steban. "When the Farc becomes a political party, I will continue to work with them. But I also hope to fulfil my musical ambitions." Late last year, Steban struck lucky. A reggae band that took part in a peace concert in the jungle invited him on stage to rap with them. The band leader took him under his wing and helped him record "Canción de Reconciliation". The song is now due to be released as a single at the end of April, Steban says. "My dream is to have a concert in Bogotá. I'm sure it will happen soon." Julian Keane will be broadcasting live from Colombia on the BBC World Service from 04:00 GMT on Friday 31 March.